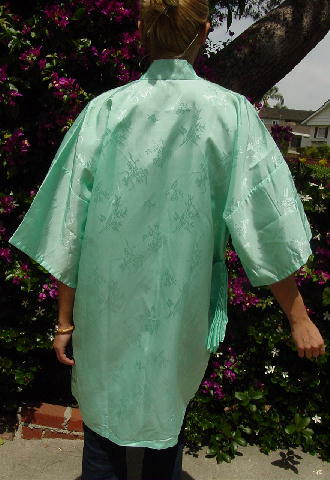 This never-worn (except for these pictures) 100% rayon light aqua-green short robe is by Longevity and was made in Mangzhou China. It has belt loops and a fabric matching (fabric still sewn together) approximately 72" long by 2 1/8" wide belt. 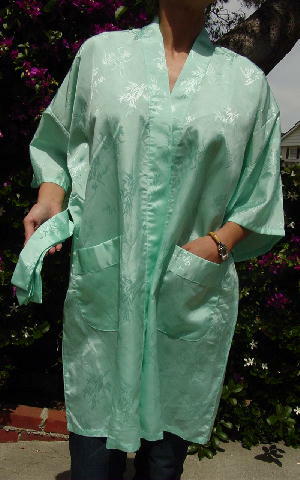 There are 2 front lower pockets. It has a tone-on-tone pattern of flowers and leaves. neckline to dropped sleeve seam 11 1/4"
neckline to end of sleeve 20"
bottom hem side to side 27 1/2"